The Blog! – Tino's WordPress Blog – Into the Great Abyss, We Shall Follow! Tino's WordPress Blog - Into the Great Abyss, We Shall Follow! 1.) I will not provide copyrighted images in ANY sort. You will be able to find them by googling “___ logo png”. I will not ever mention team names. 2.) The purchase of this application means that you understand that it will require your favorite watchface or notification program. I will let you choose the plugin that you want it to work with and you can read below of what is necessary. SportsWatch is a revolutionary way to get the most up-to-date sports information directly to your watch and Smartphone. Setting the application up is a breeze and you’ll be on your way to getting the information you need as soon as it becomes available. This application relies on “Google Cloud Messaging” (GCM) to get the information from the server to your phone and watch. The application to receive GCM on your phone is called AutoRemote. When you install AutoRemote you’ll be provided with a goo.gl/XXxXX address. That, along with the Android ID are necessary to activate your phone. For security reasons, each account is limited to one activation at a time. Once activated, you’ll be able to enjoy the full abilities of the app. Game time notifications – What time your preferred team is playing. Watch faces – Minimal & Elegant and WatchMaker are supported. Widget – If you have ZooperWidget, you’ll be able to see a widget display your team, it’s opponent, scores, and time left, or if the game hasn’t begun yet, you’ll see the time it starts. Watch on Charge; phone notifications – If your watch is on the charge, you’ll be able to get the same updates in your notification panel on your device. In the upcoming posts, I will describe each step in detail to get you on the road with SportsWatch. A couple weeks ago, I released “Wear Boarding for Android Wear”. This product streamlines boarding for most airlines by sending the boarding pass to your Android Wear Smartwatch, upon arrival at your airport, you’ll be able to scan your watch instead of paper or other types of boarding passes. The instructions are below, however, it is a relatively painless process. By configuring a geofence around the airport. Then, scan the boarding pass with a screenshot or, scanning it off your monitor (or other device). You’ll be flying in no time, without the hassle of pulling your cell phone out while you’ve got your hands full of baggage. This application will allow a mobile boarding pass to be shown on your device, even if your airline doesn’t support smartwatches. When you arrive at the airport, there will be a card on your watch, waiting for you at the gate to board your plane. This technology is quite new to airlines and even the best of the best haven’t quite got it nailed down yet. You can do it with the power of your own two fingers, any Aztec/PDF417/QR boarding pass and, the very approximate location of the airport. The user will set the location and boarding pass information using two very renowned programs called “AutoLocation” that will help you set these “geofences” then, scan (or take a screenshot and import) the boarding passes in “Wear Codes“. The day of the flight, your Geofence monitor activates, when you arrive at the airport, the card is shown to scan at the gate. -Enter the lattitude and longitude or airport address and press the magnifying glass at the end of the search line. -Use the plus symbol in the map area to zoom in. The airport should be visible. -On the blue slider below the map, engulf the entire airport area in the lightly shaded area. -If the lightly shaded area doesn’t cover the entire airport when you slide the slider all the way to the right, press the down icon at the end of the slider and enter a figure such as 1000. -Take a screenshot of your boarding pass on your airline’s mobile app. -Wear Codes may import it without a crop, or will ask you to encapsulate the code in a box. -Save this by pressing on the check mark near the top of the screen. -Aim your camera at the bar code and it will accept it when it fully reads it. -Press the dropdown to convert your code from PDF417 to Aztec. -Press the checkmark on the top to accept the code. Finally, run this program to specify your flight dates.. After this, you’ll be all set. You can use airport codes, airport names, whatever you choose. Just remember, each airport geofence references the same boarding pass.. Name them alike, you’ll be able to fly the skies without the need to expose your pattern or pin! Today I released two Active Display Notifications on the Play Store. These Notifications are for Motorola phones and those with AcDisplay. The Battery Widget allows you to see the current battery status without having to turn the display on and will also give you updated weather for your zip code that you enter in the setup. This notification also will allow you to adjust when the notification shows up with certain ranges in battery percentage and, you can also toggle weather if you decide that you don’t want it. The second is a music notification that requires AutoNotification from www.joaoapps.com. This Active Display notification will refresh for each new song that is played on Pandora or Google Play Music. If you have other applications you’d like me to integrate into this app, please feel free to email me at the address listed on the play store entry. Links for these apps will be posted when they become live on the play store. After a cease and desist was issued from Google (that now owns Nest Labs, Inc.) I was forced to take down my widget. I am still not clear on the exact reason, it appears that Nest doesn’t really want any development before the official API comes out. Geofencing for the Unofficial Nest Widget. Geofencing is a GPS technology that draws an imaginary fence around a specified radius of your home then allows certain automation softwares to let your phone or tablet do amazing things when you leave or arrive or leave your geofence. After a very detailed discussion on how the Unofficial Nest Widget works with Away, I found the need to design this application for people that don’t have the Nest mounted optimally for its built in “Auto-Away” functionality. Android does not come with any built in programs and the use of AutoLocation from joaomgcd is needed for this. The program is simple to use and the only geofence needed for this application is a “Home” geofence. Once this “Geofencing for the Unoffical Nest Widget” is installed; the app will ask you to install AutoLocation (paid), when that is downloaded and installed, open it up and “Manage Geofences” then press the plus symbol on top. Define your geofence by forming a circle around the radius of your home, then click “Accept Geofence” and give it a name. Now, open up the “Geofencing for the Unofficial Nest Widget” and tell it what you named your “Home Geofence”, press the check mark and you are good to go! You’ll now have the peace of mind that you are not wasting electricity or fuel in your home! 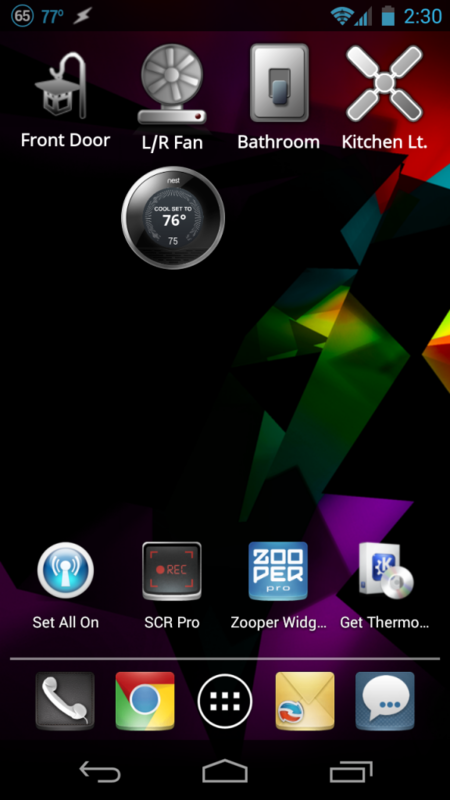 Without further adieu, I bring you the Unofficial Nest Widget! The instructions for installation are on the market page and I’ll go through some of the main functions of the widget in this post. After careful consideration and hours spent in development it was time to “pull the trigger” and make this public. Previously, I was waiting for the official API from Nest to come out, however the Google acquisition of Nest Labs has apparently held things up and, I didn’t want users like you to suffer any longer, without the use of this widget. Currently, the widget supports one thermostat, but in the very near future, it will support multiple Nests, even with multiple accounts. At installation you must install the widget from the store and EventGhost to get information to and from the thermostat. The plugin instructions are here: http://goo.gl/vDDaRp or in the app at first run. The app will also guide you to a link for all the downloads you’ll need for your PC. Once you get it fully installed, you can run the app and start getting data from the thermostat. The instructions to use the app are pretty simple. On the Nest’s screen, you can press on the upper half to turn the temperature up, and the lower half to turn the temperature down. If your Nest is in range mode press the upper left to bring the heat set-temperature up and the lower right to set the heat temp lower. Same goes with the cool; upper right and lower right of the screen bring the Nest’s set-temperatures for cooling up and down. To make the widget disappear, there are a few ways of doing this. First, you can shut your phone’s display off. If there is an incoming call, it’ll also disappear. 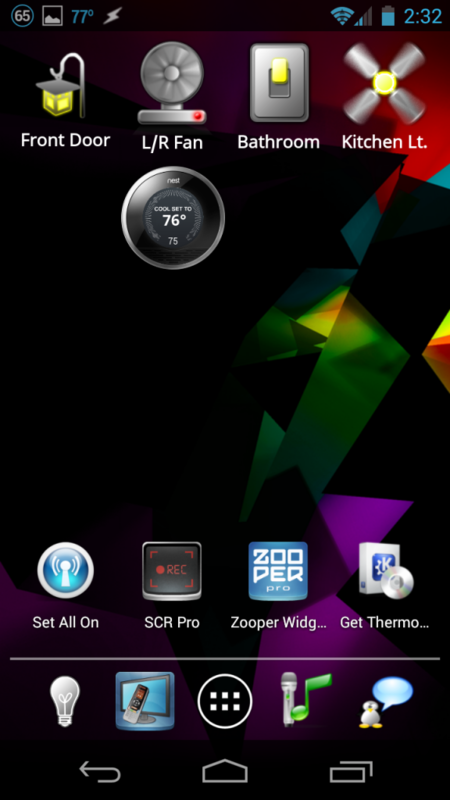 For normal use, just long press on the Nest’s logo (top-middle in the black ring) and the widget will disappear. To change the thermostat’s primary mode of operation, you’ll find that in the lower half of the ring. Just press on the grated area in the bottom half of the ring, also known as the Nest’s sensor area. A menu will appear to prompt your input for what mode you desire for the thermostat. After that, you will see the Nest Widget go into the mode you selected after reporting is complete. If you need to open the Nest’s Official app from the widget, just tap on the Nest logo on the top of the ring. Once you install that, long press on a blank area of your home screen, find “1×1 Zooper Widget” and then press on the widget to open the configuration and choose “Unofficial Nest Widget”. In most cases, you should never edit anything on this widget, however, the only thing you’ll need to edit is the “Widget on tap” should open the “Nest Widget”. After you are at your home screen, you should be able to press that widget and the larger widget will appear to allow you to adjust temperatures or mode operation on your thermostat. Have you ever wanted to operate your Nest thermostat by using the Universal Devices’ ISY99i or ISY994i? If you have, you are looking in the right place! This plugin and the instructions outlined below will enable your ISY99i to ISY994i to control the Nest thermostat by changing variables. These variable changes can be introduced in the ISY’s programs that you have already designed. If you have an ISY program that runs while you are away from your house, you can add a “Set variable” in your program to set your Nest’s temperature to make sure you are earning your leaf! Like it colder at night while you are on your way to sleep? Insert a variable into your ISY’s program to set the temperature lower. The possibilities are endless, limited only to your imagination. Extract the ISYEvent.zip (from this link – ISYEvent) to your EventGhost program directory in the plugins folder. Make sure to use a special directory/folder for ISYEvent and the Nest plugin and to move both to their respective folders. Open EventGhost for the first time and, delete most of the default tree, add and configure the ISY99i and Nest Plugin, and add the “Timer” plugin. Reactivate the EventGhost window and click on any part of the tree. Press Control-V to paste the copied content from ISY-Nest.xml into a folder on Eventghost. Make some new state variables on your ISY99i or ISY 994i for Set-Temp and Ambient-Temp, make note of the two variable numbers on the left side of the ISY variable panel. Open up the “Read ISY Event” macro (gear icon) and double click on the Python script in that macro. Alter ONLY THIS LINE: “if VarNum == “10”:” to reflect the proper digits of your Set-Temp variable that you created on your ISY. In my case it was 10. Click Ok.
Edit “username:password@isy.ip.here” to your username/password for your ISY and the IP address. Edit ” set/2/17/” to the number you have entered in the previous entry for “Ambient-Temp”, and click OK.
That’s it! Now you can start designing programs on your ISY to change your Nest’s temperature! Donations gladly accepted: abuttino@gmail.com (Paypal). Further assistance is available for donators. In the past decade, we have become a more “connected” society. But is all of this good for us? After reading several psychology reports that discuss users of iPhone as well as other mediums of delivering communication have suffered “Stockholm Syndrome” in one way or another. “Stockholm Syndrome” is a psychological condition that appears in victims that defend and empathize with the captors. In the case of iPhone; we have a smartphone that is about 10 years behind technology of what current smartphones have. Users of the iPhone staunchly defend the products general usability because they have no idea that there is a phone that offers more productivity. If it has a white background in the latest marketing ploy, they’ll line up at the door in the thousands to get the most recent iPhone that displays no technical innovation but has catchy words like “HD” and “Retina”. This also falls in line with the “followers” on Facebook. It is no secret that Mark Zuckerberg does not care about your privacy. However, the people still join this community like a Zombie gravitates to brains and live humans. Children are being brought up with this new mentality because the parents decide not to spend time, or put them on an iPad, whilst the parents can have adult conversations. The most disappointing thing I see every day is a well-to-do family putting their kid in front of a computer such as a tablet so the children “go away” and mommy and daddy have “fun time”; resulting in a socially misfitted child which will not understand how to react when confronted with awkwardness or challenges. If you are a parent reading this and you are guilty of it, please stop. The problem doesn’t stop at bad parenting either. Schools have been buying computers en masse and the teachers have less and less teaching to perform. There is absolutely nothing good that can come of this. My profession is directly related to technology with skills in “Management Information Systems” and “Information Technology”; I am very skilled at my job, each skill was learned at a basic level, from math to history. The grade schools I attended didn’t teach anything on a computer until 11th grade, then, only keyboarding was taught, everything else was hands on. Other than breeding these kids to be a mindless bunch that conforms to the programs specified, how are we supposed to ensure our future existence with no innovation? Just think of this: The parents who can’t afford a laptop/iPad/iPhone are giving their child more “problem solving skills” than your kids. This develops into self-respect and common sense, creating an intelligent human being; worthy of the human race. Our children cannot thrive when being taught on computers, they learn nothing of dexterity, fine motor skills and problem-solving. It’s just as plain as you can get it. Video Games, computers, tablets; are not worthy of a teacher. When your mummified children reach the age of getting jobs, you are forced to hand down your very successful company to a misfit (your offspring) or, someone that can handle the challenge with the problem solving skills, a vocabulary larger than “LOL” and “BRB” that knows how to use his hands for more than texting, tweeting and, liking something on Facebook. The iPhone isn’t the only thing “Americans” line up for. Black Friday is less than 30 days away, there is no longer a “Christmas”. The liberals killed the ideas of that and call it “Holidays”. The idea to buy more things you don’t need, to make sure your kid has something that nobody else has. He can brag to his friends that he got it and the other friend did not, very disturbing behavior. Lining up to get these items, to have trampled and shot your fellow man for a PS4 and iPad is just rampant abuse of consumerism by manufacturers and retailers that love to watch the ensuing chaos. If you are doing this; you are teaching your kid this behavior is normal and will suffer the same consequences as the person that is putting the child in front of the tablet. This extreme anti-social behavior that adults are implanting in children is a signal that we have become a sociopathic generation that pays no attention to the long term effects on our youth. Each child is a prisoner of their own youth, they have to make mistakes and learn from these mistakes, some become rich and successful, some are ditch diggers and some spend their lives behind bars. With the path that we are leading our children, they are all destined for some sort of incarceration because you are not teaching them otherwise and the children think it’s “OK” to act like a heathen, blind to their surroundings. Show your children why privacy and sanctity are good things, not handing them to Facebook, Apple or the local hacker. For most, I’m too late. Your kids are already iCrap zombies with a Facebook account LOL’ing at my blog while they take synthetic cocaine known as Ritalin or Adavan, all because you never paid attention to them. With life training, your children will be able to build a house, fix a car, start a business of their own, and so much more. With iTraining, you’ll be lucky if they see the light of day outside a cubicle, doing grunt customer service work, paying a mortgage in a loveless marriage they shouldn’t have gotten into. Eventually, killing themselves because nobody ever taught them life skills on coping with reality. INSTEON and MobiLinc with Tasker. Part 7. Voice control of the lighting system is made possible with AutoVoice. With each voice command, such as, “Turn the living room light on” or “dim the living room light 50%”; AutoVoice utilizes the Android Speech-to-Text engine to translate your voice commands for Tasker’s use. AutoVoice has advanced functions for Regular Expressions to be used in the trigger to give a command such as: “Turn the Bedroom Lights on” utilize the same task as “Turn the bathroom light on”. Inside the task you separate these two phrases to have it control each of these lights. With each word spoken, Tasker analyzed the phrase to discover if there are any words matching the light or unit, then will give the command to toggle the light. After a match is found, Tasker executes the MobiLinc command to toggle the light on or off, dependent on the words the user spoke. The use Regular Expressions is not necessary for beginners or intermediate use of AutoVoice. 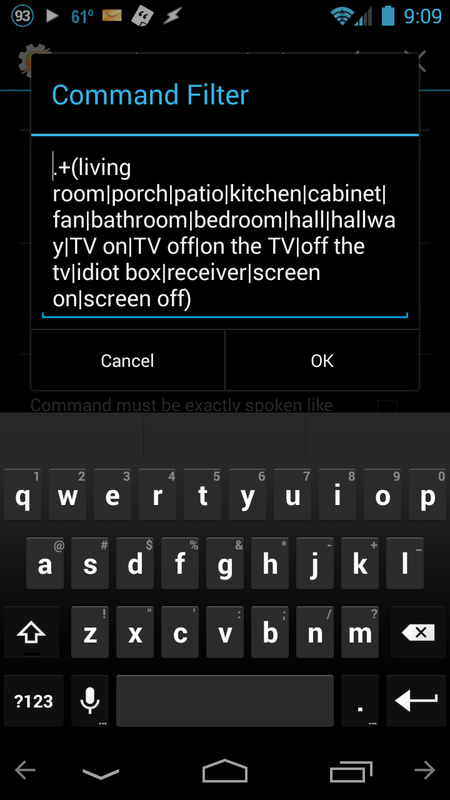 The command filter (trigger words) can be as simple as “turn the living room light on” and the task that it links to turns the corresponding unit on. Believe it or not, each of the toggles I have shown in this series are used at least once a day. It is nice to be able to turn the kitchen light off after I have gotten into bed at night without getting up again! I hope that you have enjoyed this series on Tasker integration with MobiLinc and the ISY. If you have any questions, please leave a comment and I will answer it as soon as possible. If you are interested in having me fully customize your home automation, leave me a message and I will contact you to discuss your needs and pricing. INSTEON and MobiLinc with Tasker. Part 6. In my first post, I discussed the message that gets sent to my phone by the ISY and AutoRemote, this sets the variable for each of these units/lights. Zooper works off these variables – each time I toggle a light in whatever means possible, this widget updates the status and displays the proper icon.